Clarity I1 Visible Inclusion. Total Carat 3.07 Carat. Color Fancy Yellow (Brownish, Color Enhanced). Cut Cushion Cut. 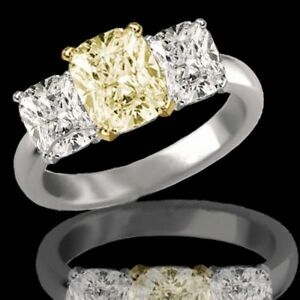 Total Carat Size 0.80 Carat. Diamond Origin Enhanced Natural Diamond. Center Stone. Free postage on orders of 5 or more eligible items from watchmarketplace. US $0.00 postage for each additional eligible item you buy from watchmarketplace.